Mount Hood, Eliot Glacier, and Adams and Rainier in the distance: just a little of nature’s eye candy I enjoyed on this trip. Last weekend we headed up to Mt. Hood’s lesser explored north side for a “winter” backpacking trip. Unfortunately, the term winter to describe this trip is a bit up for interpretation. With record low snowfall in the west this year, most resorts at Mt. Hood have only a couple feet of snow at the base areas (and that’s by a generous estimate! ), rather than sitting pretty with their usual 100+ inch base by late January. So, what was to be an epic backcountry skiing adventure, turned into more of a relatively easier hiking and snowshoeing epic adventure. There was a bit of slushy snow on most of the trail, but the surrounding area was dry as summer. My boyfriend and I, along with another friend headed out Friday morning from Portland towards Hood River, stopping to add four more to our caravan in Hood River then turning south towards Mt. Hood. From Hood River, its a quick drive to the sno-park where the trail begins, just down the street from the Cooper Spur Mountain Resort. After greeting the rest of our party who had driven up from Bend (about three hours from the trail head…which is why this trip is best done over a long weekend), we loaded up our packs and set out on our hike. Typically, you’ll find snow, right at the start of the trail at the Cooper Spur Sno-Park, but this year, the low snow fall meant that although the parking lot was slick and icy, we had to hike over dirt and patchy snow for the first half of the 2.5-3 mile hike. When we did this hike last March, we followed the Tilly Jane Trail 600-A the whole way up. This steep and winding trail starts at the parking lot and leads right up to the Tilly Jane A-Frame. However, because it starts by following the creek bed, it can be a bit difficult and annoying to negotiate unless the conditions are just right. So this year, we instead opted to take the more popular route, cutting through the Cooper Spur Ski Area, and then rejoining the Tilly Jane Trail at the 2.5 mile junction. The hike through the ski area is steep, but wide-open, easy climbing. Up above the ski area, a mostly flat spur connects back to the trail and then the hill-climbing starts again. The trail steepens quickly, gaining about 1,700 feet in elevation, in just 2.5 miles. About halfway through the hike, the brushy undergrowth, towering firs, and other familiar landscape elements of the Mt. Hood National Forest give way to the stark and breathtaking burn area. In 2008, the Gnarl Ridge fire burned through just over 500 acres on the north side of Mt. Hood, narrowly sparing the historic structures of the Tilly Jane Cloud Cap area. The fire left behind a tapestry of charred trees and barren land, where today the vivid green of new growth is a sharp contrast to the black-and-white landscape. Another awesome pic of the burn area from my pal C. Thanks for stopping every couple minutes to snap pics. Sometimes I forget to slow down and enjoy the view. The hike continues through the burn area, heading northwest until eventually, the old Cloud Cap Inn comes into view, up on hill to your right, and you know you’re almost there. But before the final few hills to reach the Tilly Jane area, we first have to make our way across what we have lovingly named The Traverse. The TRAVERSE! So much harder than it looks. This quarter-mile stretch of trail cuts horizontally through a steep hillside, with just a narrow ledge to walk on. When we hiked the snow covered trail last year, the Traverse was slow and tedious. Not quite wide enough to be walked in snowshoes, we side-stepped across it slowly. This year the trail across was icy, so we had to go slowly and rely on our downhill poles to save us from rolling down the hillside. The Traverse is probably nothing more than a good calf workout when the trail is dry, but in the winter, this section of the trail is the number one reason why many skiers opt to take the adjacent Pollalie Ridge Trail, which follows the ridge-line to the west and is considered to be less hilly and an easier option if you’re skinning (ski touring) in. After the Traverse, there’s a few more leg-burning hill climbs before the Tilly Jane A-Frame comes into view. The A-Frame is a two-story log cabin, built in 193os by the Civilian Conservation Corps. This rustic cabin has a loft that sleeps 20 and downstairs there’s a wood stove, tables and cooking areas. The Tilly Jane A-Frame, unfortunately quite lacking in snow this year. Last year, we stayed at the A-Frame, reserving spots for our group of 4, among the 16 other individuals that made up groups, families and single skiers on the mountain that weekend. While we loved the social, ski-bum atmosphere of the A-Frame, after spotting the cozy cabin just down the path, we were itching to check out our other options, and so this year we rented the Tilly Jane Guard Station. Glamping at the Guard Station! The Guard Station, also part of the Tilly Jane Cloud Cap Historic Area, is just a couple minute walk from the A-Frame, sitting above a creek. While the A-Frame might be considered “roughing it” for a winter cabin outing, we found the Guard Station to be much or along the lines of what we’d consider Glamping. This two-story historic cabin has an upstairs sleeping loft, complete with fairly clean foam camping pads for sleeping on. Downstairs a fireplace built into a rockwall separates the living room and kitchen. The cabin was stocked with pots and pans for cooking, firewood, and lots of goodies we didn’t expect to find like paper plates (yay! no dishes! ), board games, and an assortment of musical instruments. Because, really what winter cabin isn’t complete without bongos, a banjo, a recorder, and a cowbell? We spent our first evening playing frisbee out front, exploring the nearby Tilly Jane campground, and drinking wine and playing cribbage by the fire. After dark, we wandered over to the A-Frame and found a roaring bonfire going out front, where we pulled up stumps to sit on and chatted with some new friends, making plans for our hike the next day. Saturday morning we loaded up day packs, slathered on sunscreen and strapped on our snowshoes for a hike to Cloud Cap and up to Cooper Spur. The Cloud Cap Inn is just above the Tilly Jane area right at the tree line, and although it might look like a quick hike through the trees up to Cloud Cap, it took about 30 minutes because this little-used path was covered in downed trees. A quicker route is just through the campground and up the steep Cloud Cap Road , which should take 15-20 minutes. The Cloud Cap Inn is actually an historic structure, opened in 1889 as a rustic mountain inn. Doomed to failure by its remote location and the coming Great Depression, the inn failed and was sold to the government. In 1954, the Crag Rats, a Hood River based mountain climbing group, took over ownership and upkeep of the inn, eventually restoring it to the beautiful honey-hewed log cabin we see today. 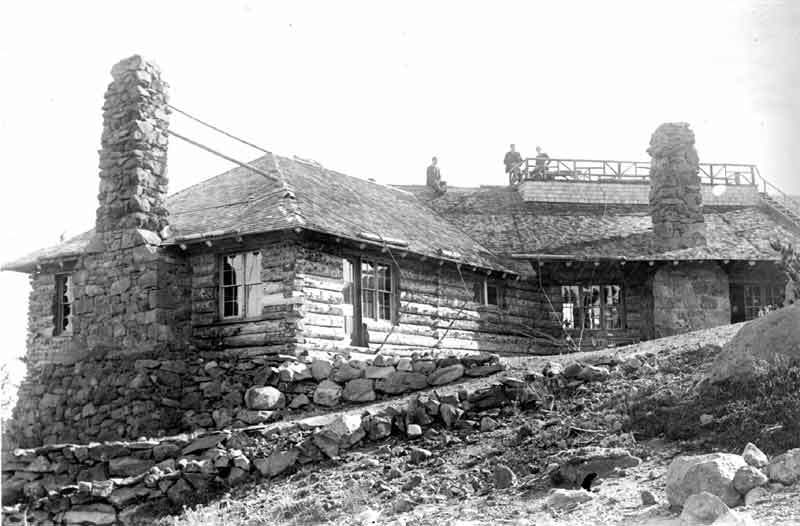 The Cloud Cap Inn under construction in 1889. The inn looks up at the north face of Mt. Hood with clear views of the rugged Eliot Glacier and Cooper Spur, a rocky backbone stretching northeast up towards the summit of the Mt. Hood. In the winter, the spur is snow-covered, rising above snowfields perfect for skiing, while in the summer the snow melt leaves behind a dusty, rock strewn path, and the highest hiking trail on all of Mt. Hood. After exploring the area around Cloud Cap and attempting to peek into all of the windows boarded up for winter, we set out up the mountain towards Cooper Spur. The normally well-marked trail was under a foot of snow so we hiked generally northwest, in the same basic route we’d followed hiking the trail last summer. Climing up above the treeline and the fog on the Cooper Spur trail. But after awhile of wandering, we decided to hike straight up the moraine, a rocky spine that rises up above the Elliot Glacier washout towards the summit. The narrow back of the moraine rises so steeply out of the mountain, that all the little rocks and pebbles that we dislodged during our hike, tumbled downwards hundreds of feet into the ravine below. Looking north from the moraine at three Cascades “peaking” (pun totally intended) out of the clouds and something else too. Where’s Waldo? After a grueling 30ish minutes climbing up the moraine, we headed west aiming to find the Cooper Spur rock shelter. Our group of 10 split into three smaller groups (really not a safe hiking practice I’m ashamed to say) and we all arrived at the rock shelter by different routes. With my boyfriend and a few friends, I half hiked, half slid down the snowy slope between the moraine and the spur, and ended up actually spotting a cairn marking the real trail. From there, we proudly marched up the trail, about 10 minutes to the rock shelter. The rock shelter was built as an emergency shelter for climbers, with four rock walls and a plastic covered entrance. Unfortunately, every time we’ve been there, the doorway plastic has been blown aside and the entire shelter has been filled with snow. This time was no different, so we found a spot to sit outside, and enjoyed the view and lunch while waiting for the rest of our party. Best seat on the mountain! The hike down was quick, taking about 30 minutes for our group, and 20 minutes for the other half of our group who had taken a more direct route. Next year (even if I have to start snow dancing in September and sacrificing pineapples to the Pineapple Express gods) I’ll be skiing this, fingers-crossed. After descending through the open snowfield that would’ve been our skiing route had we had the energy and enthusiasm to bring skis and snowboards up the trail, we dropped down into a tree-lined gully.The gully eventually found its way to the edge of a creek which we followed back to the cabin. The route of what could’ve been some great tree-skiing in better conditions. We spent the rest of the night nursing sore muscles and cups of whiskey and wine before turning in for a cozy night in the Guard Station. The next morning after breakfast, we packed up, cleaned up, and started our hike down. The return hike took just under two hours, shaving about an hour and a half off from the time we made on the way up. Hiking out in the rain, this was actually the most gear I had to wear all weekend because it was so sunny and warm. Everybody’s Brewing: Good beer and no judgy looks for smelling like we hiked a mountain and haven’t showered in three days, great place. Hope you enjoyed reading about my backcountry snowshoeing trip, and check out my next blog on backcounty skiing at Mount Bailey, in March. Tags: adventures, backcountry, Cooper Spur, Mt. Hood, Oregon, snowshoeing, Tilly Jane, weekend trip. Bookmark the permalink.